At Spa Heart & Home, we love nothing more than soaking in a hot tub. Since ancient times, people have relaxed both alone and with others in hot springs, building pools and tubs to further enjoy such areas. Although many people today think associate soaking in a tub more with personal hygiene, it can be a relaxing and recharging experience. Since around 759 CE, Japanese people built pools surrounding volcanic springs, which were abundant in a country filled with active volcanic islands. 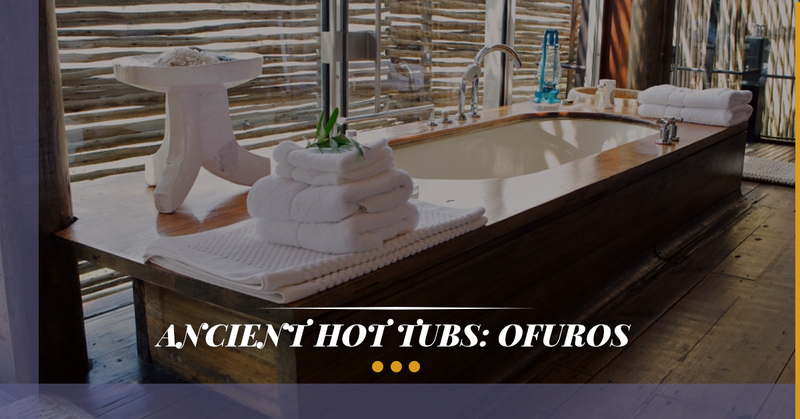 Over a thousand years prior to the invention of the modern hot tub, ofuros were built for Japanese to soak in. Traditionally, ofuros are constructed out of Hinoki wood, which is also used to build shinto temples. Not only does this wood contain antiseptic properties, but it features a clean, lemon-ginger fragrance, adding to your bathing experience. Do People Bathe in Ofuros? Meant for relaxation and meditation, ofuros are not meant for bathing. Traditionally, people bathe prior to stepping into the ofuro. Are Ofuros Similar to Bathtubs? In comparison to bathtubs, traditional ofuros are deeper with square sides and have a different drainage system. Rather small in size, ofuros are only meant to hold one person at a time. In a household, the oldest family member would bathe first and then the next person in age would soak in the water. It was believed that the younger person could absorb some of the older person’s wisdom through the water. Although we don’t sell ofuros at Spa Hearth & Home, we sell a variety of different hot tubs and swim spas for your enjoyment. The best part is that you don’t have to wait for your grandma to get out of the tub to use it. Our spa store has a variety of different sizes of hot tubs so that several people can enjoy the experience together. Think of a swim spa as a cross between a pool and a hot tub. Swim spas can be bigger in size than a regular hot tub, so more people may be able to soak in a swim spa together. Swim spas provide a great form of exercise in the privacy of your own home. For people love to swim but hate the nasty pool at the local gym, a swim spa could be a great option. If you are recovering from an injury or experience any joint pain or stiffness, swim spas provide a low-impact form of exercise. Through regular swim sessions, you should be feeling stronger and healthier in no time. If you could care less about swimming, a hot tub might be a better option. Our spa store offers several different hot tub brands, including Catalina Spas, Signature Spas, and Artesian Spas. Would you like to end your day soaking your stresses away? Buy a hot tub as soon as possible to experience its benefits. Spa Hearth & Home features an impressive showroom filled with a variety of different spas and hot tubs and we can find the right one for you. Visit our spa store today to find the hot tub of your dreams.